Has this ever happened to you? You're in the public pool's changing room, struggling to get a bathing suit on your impatient child for your parent and tot swimming lesson and there it is. That hair on your leg you missed this morning in the shower. This happens to me ALL THE TIME, which is why I was so excited to learn about the NEW Gillette Venus Snap with Embrace. It's so small you can put it in your bag, and takes up little space in your weekend getaway bag. It works super well for missed patches, but might be difficult to do a whole body shave with the smaller handle. Also, for those ladies who have flyaway issues in the summer (me included when I'm sans pony tail) embrace your natural wave with Vidal Sassoon Pro Series Waves Enhancer Spray and Vidal Sassoon Pro Series Waves Crème Pomade. The 7-in-1 wave enhancer spray allows for maximum styling so you can achieve that tousled, beach hair look with ease! After a quick spray, just apply the crème pomade for genius curl control, leaving hair soft, touchable and beautifully defined for up to 24 hours. By entering the following contest you are accepting that if you win your contact information will be shared with a P&G PR and shipping agency for the purpose of mailing your prize. Please allow 4-6 weeks from the contest closure date to receive your prize. This giveaway may appear on other blogs as part of the #PGmom program. However, to be fair, you can only win once per giveaway. If your name is chosen more than once, another winner will be selected. All winners must be from within Canada excluding Quebec. Valid entries only. Contest ends August 18th, 2014. For further contest rules, refer to the Terms and Conditions within the Rafflecopter. 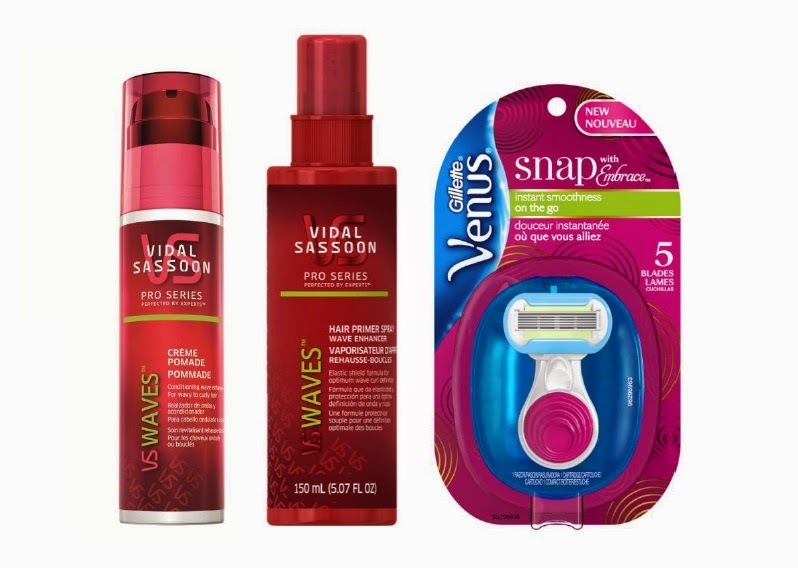 It would be great to win the P&G Summer Hair Prize Pack. What's your number one summer hair problem? My hair problem is dry flat hair. It looks gross after I get sweaty! My hair problem is frizz. Fly away hair in windy weather. I gets all dry and dull from the sun and pool. My hair gets tangly and frizzy in the summer! My hair seems to be flat in the summer time! I associate it with the humitity. The humidity makes my hair so frizzy in the summer! Frizz in the summer humidity! Frizz! My curly hair gets so thick and frizzy during the Summer. My number one summer hair problem is frizz in the humidity. My hair gets really dried out from the sun but my scalp is oily. My hair goes super limp! Frizz is my summer hair problem. My biggest hair problem in summer is it getting dry! This summer my hair seems really greasy. Regardless of how often I wash it, it fedls gross. when riding my bike, my bangs often blind me ....not safe! I have very long hair, and in the summer it is so flat and lifeless! Bailey Dexter For me my worst hair problem is frizzy waves or somethings lack of in spots! Kind of lifeless! Could use a boost. The worst for me is frizz, it's the worst when it rains just a bit and then it's really hot, my hair turns really poofy but not in a good way! Waves that are not planned caused by humidity! My number one problem in the summer with my hair is frizz. Frizz is my number one hair problem.